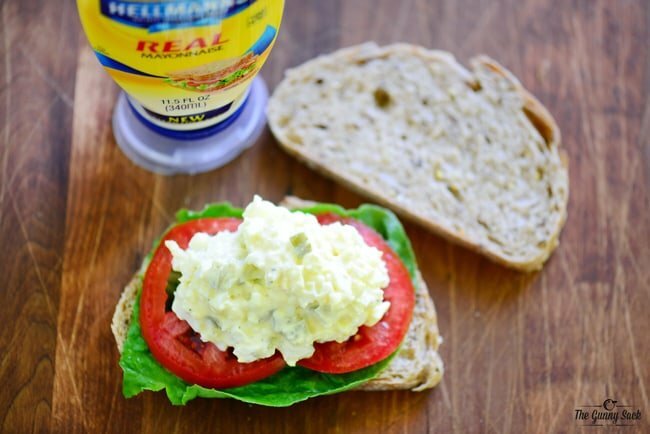 I made this “Good Luck” Egg Salad Sandwich for back-to-school, as part of a post sponsored by Hellman’s through their partnership with Kitchen PLAY. I was making myself an egg salad sandwich for lunch last week and Vanessa asked me if I thought she would like egg salad sandwiches. I couldn’t believe she had never tried one because they are one of my favorites. I told her, “You love eggs and you LOVE mayonnaise so I know you will love egg salad too!” So she tried her first ever egg salad sandwich and now she is hooked. 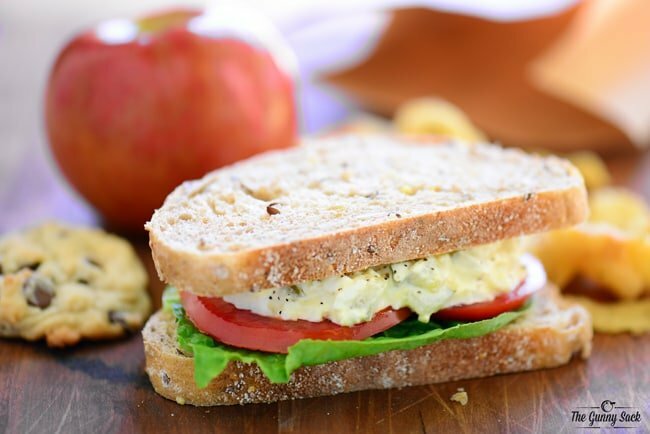 This “Good Luck” Egg Salad Sandwich is the perfect thing to pack for a classic brown bag, back-to-school lunch. 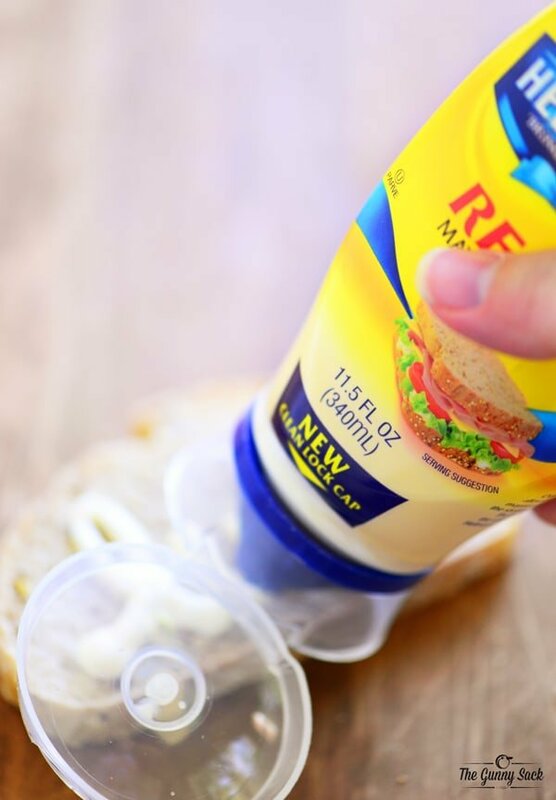 With the start of a new school year, I’m excited to tell you that Hellmann’s has a new mayonnaise squeeze bottle that is designed to get more mayonnaise out without all the shaking, banging and mess. 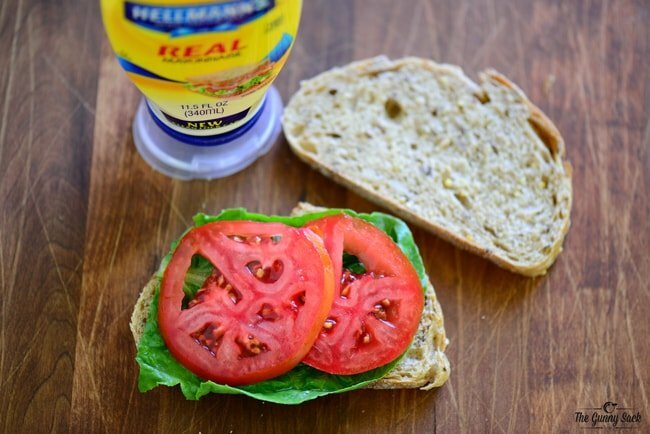 The Hellmann’s Squeeze Bottle still has the same unmistakable taste of Hellmann’s and is a better way for mom and dad to make lunch even tastier. You can put the mayo just where you want it with the newly designed Hellmann’s Squeeze Bottle with a clean lock cap and tip. It’s so precise that topping a sandwich, salad or snack with a little extra love never appeared so perfect! Start by making the egg salad for the sandwich. I like to make extra hard-boiled eggs to keep in the fridge so they are ready to go whenever someone wants one. 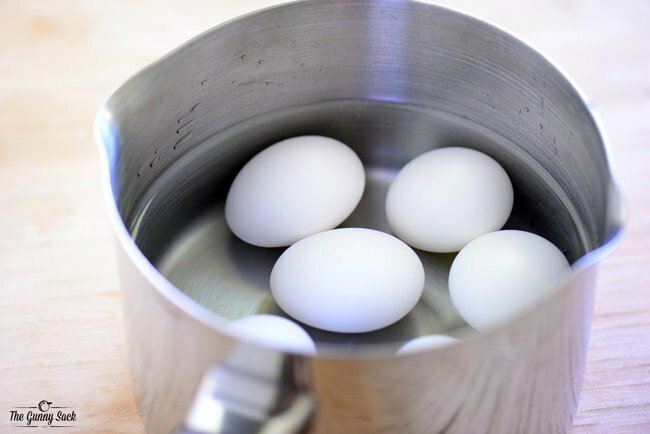 Put as many eggs as you want in a pan and add enough cold water to cover the eggs by an inch. Cover the pan and bring to a boil over medium-high heat. Remove from the heat, leave the cover on and allow the eggs to cook in the hot water for 12-15 minutes. Immediately cool the eggs with cold water. To make one sandwich, peel and rinse one hard-boiled egg. Cut the egg into slices and place them in a small bowl. Add mayonnaise, diced pickles and a sprinkle of salt and pepper. Use a fork to mash up the eggs and mix everything together. 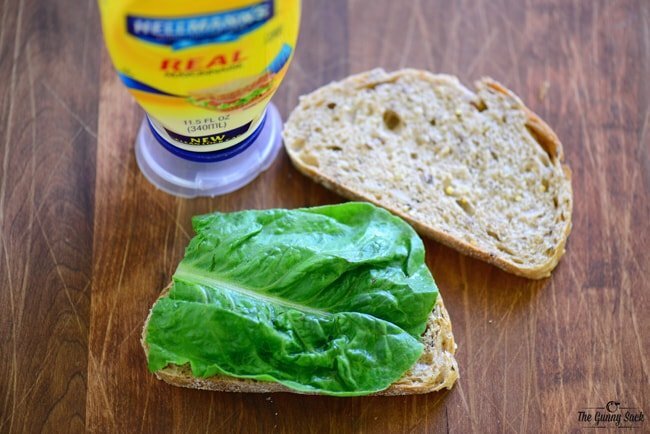 To assemble the sandwich, first add some lettuce to a slice of your favorite bread. Add two slices of tomato. Top with the egg salad. Then, use the new Hellmann’s Squeeze Bottle to write a simple message, or draw a picture like a smiley face, on the other piece of bread. You can get a coupon for .50 off the new Hellmann’s Mayonnaise Squeeze Bottle here. 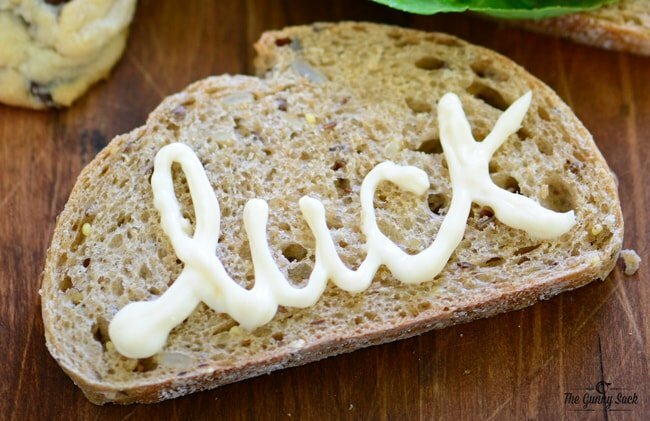 I wanted to wish Vanessa ‘good luck’ during the first week of school so I wrote ‘luck on the bread. Add the second piece of bread, with the special message on it, to the sandwich. Put the egg salad sandwich and other lunch items in a brown paper lunch bag and it’s ready to go! 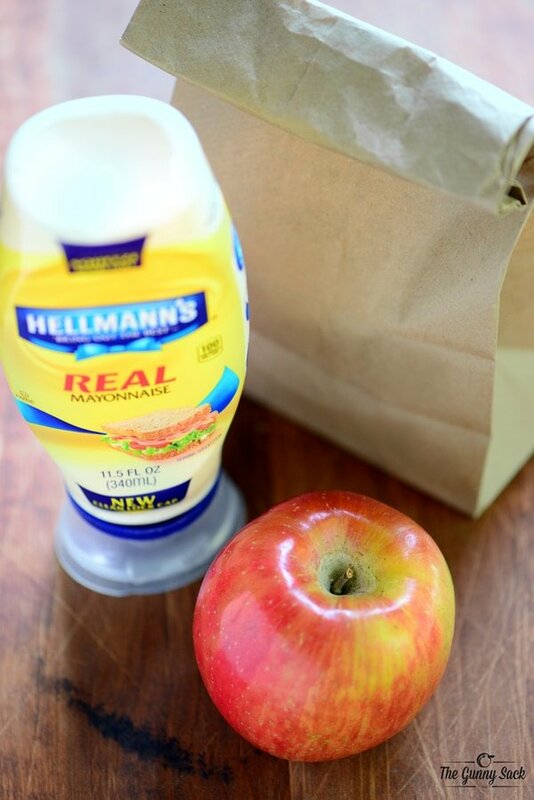 This school year, you can keep the love behind the lunchbox alive with Hellmann’s and #SqueezeMoreOut. Don’t forget to claim your .50 off coupon. Put the eggs in a pan and add enough cold water to cover the eggs by an inch. Remove from the heat, leave the cover on and allow the eggs to cook in the hot water for 12-15 minutes. Immediately cool the eggs with cold water. Peel and rinse one hard-boiled egg. Cut the egg into slices and place them in a small bowl. Add mayonnaise, diced pickles and a sprinkle of salt and pepper. Use a fork to mash up the eggs and mix everything together. Layer lettuce, tomatoes and egg salad to a slice of your favorite bread. Use the new Hellmann’s Squeeze Bottle to write a simple message, or draw a picture like a smiley face, on the second piece of bread before adding it to the sandwich. I’ve found that using a tad of brown mustard & non fat plain Greek yogurt instead of mayo is also delish. Or it can just allow you to use less mayo for a lower fat delicious sandwich. Great idea! I will have to give that a try! 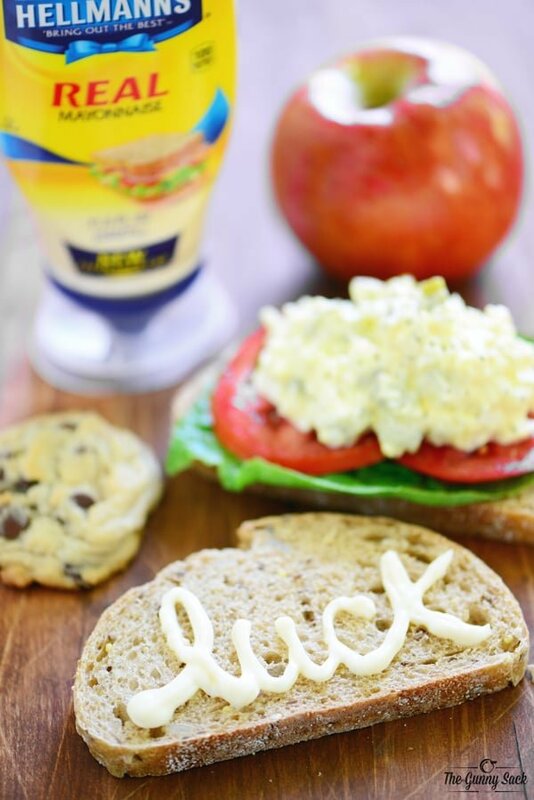 What a creatively delicious way to wish good luck and start the school day off right!! Yes! Thanks so much Kate! Thanks Liz! It was fun to make! It’s been a long time since I’ve had an egg sandwich and now I am craving one! great recipe for kids and adults… Thank you! I forget about them too sometimes and then remember how much I love them! Thanks Tiffany! I love egg salad “sammies”….I add a dollop of HONEY MUSTARD to my mayo etc…—->it kicks it up a notch! I’m not a big mustard fan, but if it was mixed into the mayo it might add some great flavor. Thanks Brenda! I know!!! It’s the best! Thanks Des! I hear ya! I couldn’t believe my daughter had never had it! Thanks Sara! Secret mayonnaise messages in a sandwich? You are so clever 🙂 Egg salad is one of my most favorite comfort foods EVER! Yours looks perfect! Thanks so much Valerie! 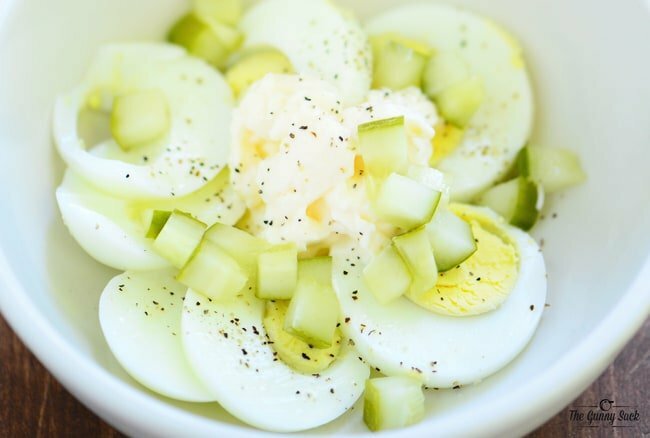 I totally agree that egg salad is fabulous! I make egg salad all the time, but I mash up the yolk, as I don’t like pieces of the yolk……and I add some parsley, onion powder and I use pickle relish instead cut up pickles……and Mayo, either Hellmans or Kraft mayo, I like them both so I buy which ever is on sale…..and I always add a bit of cayenne pepper or something a little spicy….. Try egg salad on toast too……. I love the sound of your version! It’s making me hungry! Yum! I haven’t had an egg salad sandwich in such a long time! Now I know what I need to make for lunch tomorrow! They are so simple to make but I often forget about them too! Thanks Laura! I love that you can easily spice things up for the adults! Thanks Derek! Tonia, you even bring creativity to an egg salad sandwich. You are my hero. It’s almost lunch time here and I would love to have one of your sandwiches sitting in front of me!! Awww…thanks so much Sara! I wish I had one sitting in front of me too! Ooooh pickles and eggs! It doesn’t get much better than that. What an awesome sandwich – I know what I want for dinner now! AND I really, really want someone to write sweet words on my bread slices! That is so adorable!! Thanks Katerina! I love the flavor and the crunch that the pickles add! Thanks Maris! Yes, I can’t believe my daughter had never tried it! I love a good egg salad sandwich and this looks amazing! I wish I made them more often. I know! It’s something I forget about too! Thanks Kacey! I love a good egg salad and the mayo is key! Oh definitely!! And my daughter is a HUGE mayo fan! Thanks Peter!